Well, here we are in 2014, and the sharks of Shark Night (2011) still look fake. The mechanical shark called “Bruce” who starred in Steven Spielberg’s Jaws way back in 1975 may not have been wholly convincing – which is why the director often kept it hidden or cut to P.O.V. shots – but when viewers did see the great white beast, he at least operated by the same laws of physics as we do. When Bruce broke the surface, water would run off his back. When Bruce bit a victim, blood would run down between his very sharp teeth. We might not have always believed Bruce was 100% real, but we believed that he showed up for work, at least. In Shark Night, the sharks phone it in. 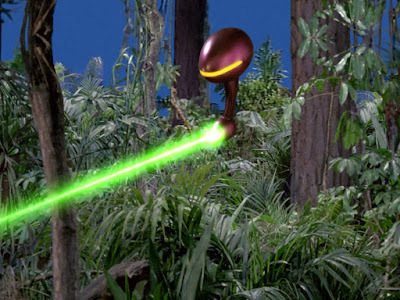 They exist in abundant special effects shots that diminish their size and sense of scale. Seen in the clear light of day, these “animals” look like under-detailed cartoons. They can’t scare anyone because they actually bear no connection to the environment forces which purportedly work upon them; forces such as gravity. 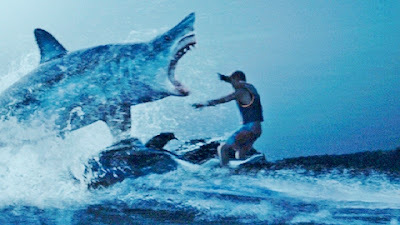 In fact, the sharks of Shark Night not only look incredibly fake – just a step or two up from Jabber Jaw -- they also act in most un-shark-like fashion throughout much of the film, often leaping high out of the water (like…twenty feet out of the water…) to swallow their cowering human prey. In one of the movie’s least effective kill scenes, a shark intercepts a racing jet-ski …from the front, no less…and leaps several feet out of the water to do so. On this occasion and several others, director David Ellis lets the shark hold center frame as it leaps towards the screen (for 3-D impact), thereby offering extreme evidence of the animal’s incredible phoniness. Shark Night earned pretty terrible reviews, and studying these special effects sharks, one can detect why. That established, I must reluctantly admit I didn’t hate this nearly as much as I thought I might, and that’s because the film unexpectedly plays around in the terrain one of my favorite sub-genres: the savage cinema. In keeping with that form, the film acknowledges human ugliness as the overriding source of real evil in the world. In other words, we might escape sharks, but we can’t escape human nature. In Shark Night, Sara (Sara Paxton) returns to her home on Lake Crosby in Louisiana for the first time in three years along with a group of co-ed friends, including shy Nick (Dustin Milligan), a med-student. 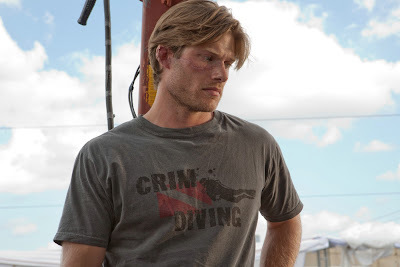 Sara has been away so long because of an accident involving her former boyfriend, local diving expert Dennis (Chris Carmack). Back when they were going steady, Sara began to drown on a dive and Dennis wouldn’t share his air with her. Panicky, she made it back to the surface alive, but when she piloted the boat for home, she accidentally struck Dennis’s face with the boat propeller, permanently scarring him. You can just tell from the first attack in Shark Night that you’re in a different league here than in Jaws. Remember that film’s classic prologue, and how a beautiful blonde went for a tranquil midnight swim only to be attacked and killed by a shark? This introduction to the film remains creepy, unsettling and highly effective, even today. By point of comparison, Shark Night opens with a blond in a white bikini swimming in the lake and getting attacked almost instantly by a shark. It’s all thrashing and splashing, and there’s no sense of suspense or even surprise during the attack. People inclined to use the phrase “they don’t make ‘em like they used to” regarding Hollywood will be sorely tempted to employ it here. Lacking suspense, Shark Night is abundantly predictable. If you’ve ever seen a horror movie, you can predict -- down to the last person (and animal) -- the characters destined to survive the film’s bloody events. Also, Joshua Leonard’s character Red is a walking talking cliche, right down to his bad teeth and bad Southern accent. He’s supposed to be the movie’s comic relief, but again, we’re in cartoon territory here. And yet, as I wrote above, I didn’t entirely hate Shark Night. I don’t generally prefer horror movies this dumb and vapid, but they can occasionally be fun if you’re in the mood for something trashy and light. Plus, Sara Paxton is the star here. She was terrific in The Innkeepers (2012) and is very good here too, despite the thinness of her character. And Shark Night boasts at least one legitimate inspiration. It turns men into the film’s villains, and gets at the notion that the sharks – while obviously the tools of mass destruction here – aren’t really the ones with the evil intent. Instead, Dennis and his mates are the ones to blame. Interestingly, they view themselves as victims. They’re victims of women (Sara), victims of a bad economy, and victims of class warfare. Their plan is to make it rich by creating a shark snuff film for fans of cable television’s “Shark Week.” In other words, they have something to sell, and they’ve had to put their humanity aside to sell it. When one of the would-be victims notes that such a money-making enterprise is sick, the evil conspirator notes, importantly “There’s no such thing as sick anymore. There’s only moral relativism.” It’s a biting, caustic commentary on our culture, but one entirely of the times. If you remember Governor Rick Perry’s comment about “vulture capitalists” who go in and eat up companies for profit, you might also see how the metaphor works with sharks. These animals (like some capitalists) must keep moving forward -- devouring things, resources and people to live -- and the rest of us are, well…merely chum. 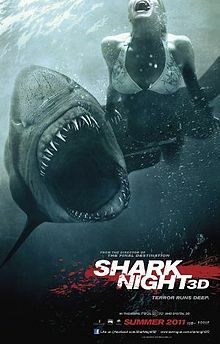 I don’t mean any of this commentary to suggest that Shark Night is deep or especially thoughtful, only that it is “of the moment.” It’s unique that unlike Jaws (1975), the film portrays man as the real terror in the water, one eager to destroy his fellow man for a leg up the economic ladder of success. The special effects in Shark Night are bad, the characters are mostly barely two-dimensional appetizers, and there’s precious little in terms of interesting narrative. Yet to his credit, director Ellis seems to know all this is the case, and at times (like during the road trip to Lake Crosby), literally fast-forwards the film so he can get to the meat of the drama – the shark attacks – quicker. Some may see this photographic trick as an admission of creative bankruptcy. But contrarily, it may just be an example of efficiently cutting to the chase. Who wants to see shallow characters talking and relating to one another when we can watch them getting chewed up and spit out instead? Shark Night isn’t a good film and it isn’t a scary horror movie. But it is amusingly trashy and lowbrow. It features moments of interest, especially whenever Donal Logue is on-screen playing-up the resentment angle of his blue-collar economic climber. I didn’t hate the movie that much, in part because Shark Night was clearly made in a spirit of dumb fun. However, if I had been the maker of Shark Night I would have gone one step further with the movie, and offered up as its ad-line the very joke from Jaws 19 in Back to the Future 2. This time, it’s really, really personal.